Democratic congressman Elijah Cummings (Md. ), the newly minted chairman of the House Oversight and Government Reform Committee, is planning to investigate the Trump administration over its decision to include the question of citizenship on the 2020 census. After previously signaling interest in the issue, Cummings confirmed to the Washington Free Beacon on Thursday that Secretary of Commerce Wilbur Ross, who has purview over the U.S. Census Bureau, will be one of the first individuals called to appear before his committee. "Secretary Ross added a citizenship question after his own Census Bureau warned that it could seriously harm the accuracy of the count," Cummings said. "Then, Secretary Ross told Congress it was all the Justice Department's idea when evidence indicates he orchestrated the whole thing." "We will get to get to the bottom of this issue, and we will do everything we can to ensure that the upcoming census is accurate, unbiased, and counts every person—as the Constitution requires," the congressman added. In March 2018, the Commerce Department announced that the citizenship question would reappear on the 2020 census in order to provide the most "complete and accurate" data on the citizen voting-age population. Historically, the question was included on every decennial census between 1890 through 1950. Despite being removed from the general census questionnaire in 1950, the question appeared on the long-form questionnaire from 1970 until 2000, when it was discontinued in favor of the American Community Survey (ACS). Ross initially stated the decision to reinstate the question came at the request of the Department of Justice, which relies on citizen voting-age population data to enforce provisions of the Voting Rights Act prohibiting the drawing of election districts that dilute minority voting power. Court documents released in October, however, showed that the secretary had discussed the issue with former White House chief strategist Steve Bannon sometime prior to August 2017. Democratic objections have centered on fears the question's inclusion could prevent illegal immigrants from accurately reporting themselves, thereby inflating or underestimating overall population statistics. Tom Perez, the chairman of the Democratic National Committee, summed up the pervading sentiment on the left when he claimed the question was a "craven attack on our democracy and a transparent attempt to intimidate immigrant communities" in March 2018. Opposition to the citizenship question has also been framed around the additional cost that would be imposed upon individuals and the Census Bureau as a whole. Ross, for his part, has countered that no added burden would be placed on either citizens and noncitizens—70 percent of whom already answer the questions correctly on the annual ACS. The Commerce Department was unable to respond to requests for comment on this story because of the ongoing government shutdown. Few on either side of the debate have discussed the potential political implications posed, especially for heavily Democratic states that count a large number of illegal immigrants among their population. At stake is the apportionment of congressional districts, electoral college votes, and over $700 billion in federal funding. Currently, there are more than 70 federal programs that take population into account when formulating funding levels. Fear of such consequences has pushed 18 state attorneys general to file suit against the Trump administration in order to prevent the question from appearing on the 2020 census. 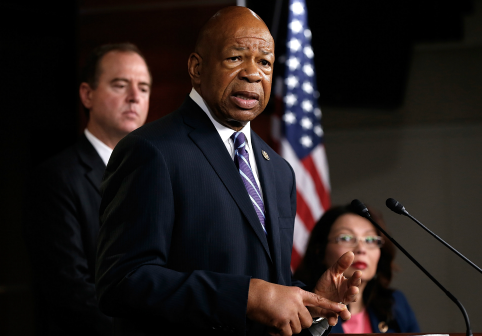 It remains unclear how House Republicans will respond to Cummings's intentions. The office of Republican congressman Jim Jordan, the ranking member on the Oversight and Government Reform Committee, did not respond to requests for comment on this story. This entry was posted in Issues and tagged Congress, Department of Commerce, Elijah Cummings, House Democrats, House Oversight and Government Reform Committee, Immigration. Bookmark the permalink.